IT lasted barely two minutes but felt 'like a typhoon' when 100km/h winds tore through the Hunter Valley town of Kurri Kurri. Dozens of buildings on the main street were badly damaged with the town library, pub and public school bearing the brunt as the ferocious storm hit at about 2pm. Two women had to be rescued by police after becoming trapped when the roof of the library collapsed. The pair was taken to Maitland Hospital with minor injuries. A lightning strike ripped a hole in the roof of the Kurri Kurri Hotel and did it so rapidly that patrons didn't even have time to get off their stools. "It happened really quickly, the chimney blew over. It's a heritage building so it's going to be really hard to get it back to what it was," publican Jim Sullivan said, describing the storm as a mini typhoon. Mark Roberts said he had "never seen anything like it". "There were hailstones coming in. You could barely see out the window," Mr Roberts said. Baker Cheryl Baker said the whole town was "devastated" by the "flash storm" which brought trees and power lines down. "Washing machines and dryers from the second-hand shop got picked up and have been flying down the road with the storm," she said. "There are trees down on cars and it is raining really heavy. The lightning struck the pub and there is now a hole in its roof. The library roof has also fallen onto the power lines over the Centrelink building. We've got no electricity at all." The roof of the ambulance hall, which housed an after-school childminding service, was ripped off, while at Kurri Kurri Public School huge trees came down and the playground was covered in debris. Central Hunter Police Superintendent Craig Jackson described the storm as "two intense minutes" that struck the town without warning. "The storm has taken roofs of various businesses in the town centre of Kurri, taken off awnings and we've had two women rescued from a partially collapsed building,"
Supt Jackson said. "It's one of the more powerful storms I've seen, there is quite a lot of damage. There was no warning for the intensity. It has taken everyone by surprise. "Between the emergency services, it's going to be a busy night." 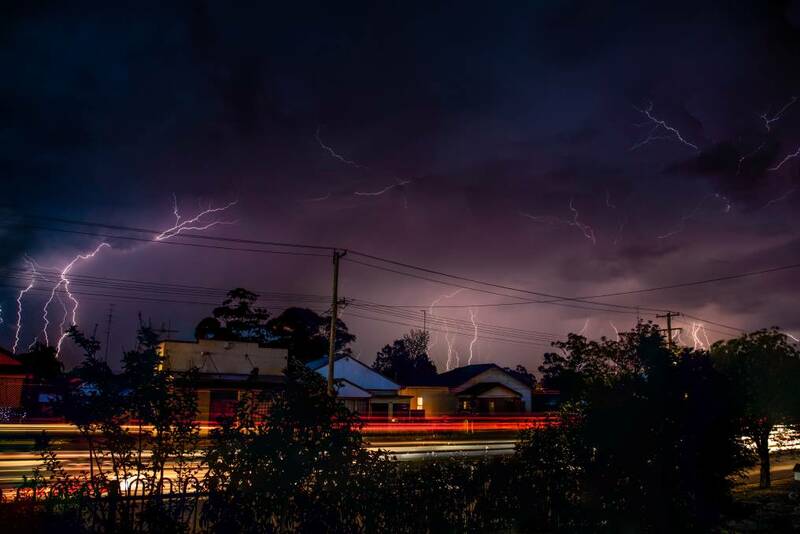 At the height of the storm, there were almost 2300 homes without power in Kurri Kurri, Weston and Mulbring. State Emergency Service spokeswoman Sue Pritchard said the SES had close to 100 calls for help in the Kurri Kurri area. "There are so many jobs but the worst has been roofs of houses, an office block affected, leaking roofs, fences down on driveways and generally quite a lot of damage," she said. "We are expecting the winds to keep continuing and we are asking people to protect their properties because this is just the start of a few months of the storm season." The SES responded 500 calls for assistance across NSW. Illawarra recorded up to 150mm of rain and Sydney had 70mm. Hail the size of golf balls fell at Narrabri, and 10cm of snow was recorded at Perisher.